Baist’s Real estate atlas of surveys of Washington, District of Columbia. Philadelphia: G.W. Baist, 1919-1921, pl. 25, v. 3 (Map Division, Library of Congress). “Square” 2147, the center of which became the British Embassy location, is actually the triangular section below Observatory Circle. There persists the unfortunate belief in some publications that in the 1920s the government of the United Kingdom chose a remote site with “little civilization nearby” for their new Washington Embassy. 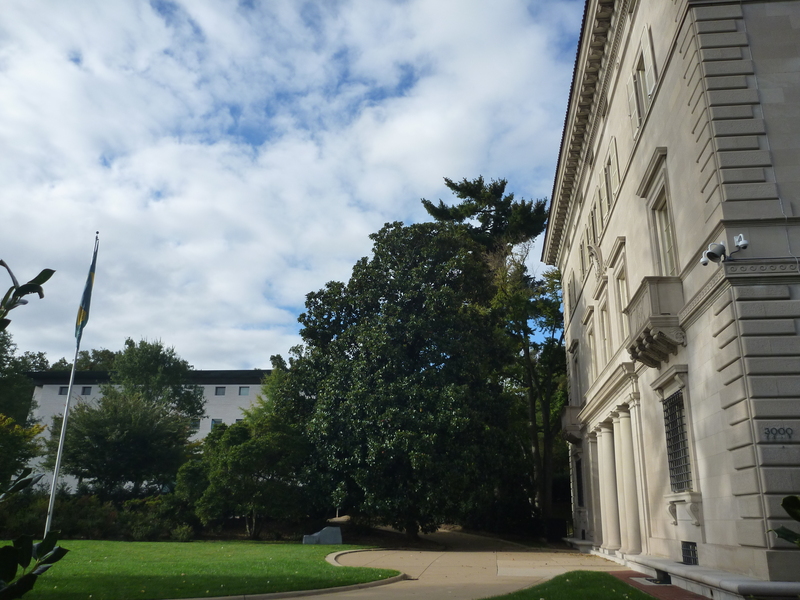 While the British with their previous diplomatic building pioneered the countryside around Connecticut Avenue—with livestock pens and crumbling Civil War barracks for neighbors—that is not true of Massachusetts Avenue Heights. There had been prominent early to mid-19th-century estates in the immediate vicinity of Washington County (as it was known then) and where the current embassy is located. These properties had mostly met their fates due to growing pressures of the booming Washington City before the Lutyens site was selected. In fact, the entire area was being rapidly developed with homes for a new type of upper class for the capital. With the announcement of the northwest extension of Massachusetts Avenue in 1886, land speculation around this corridor took off. 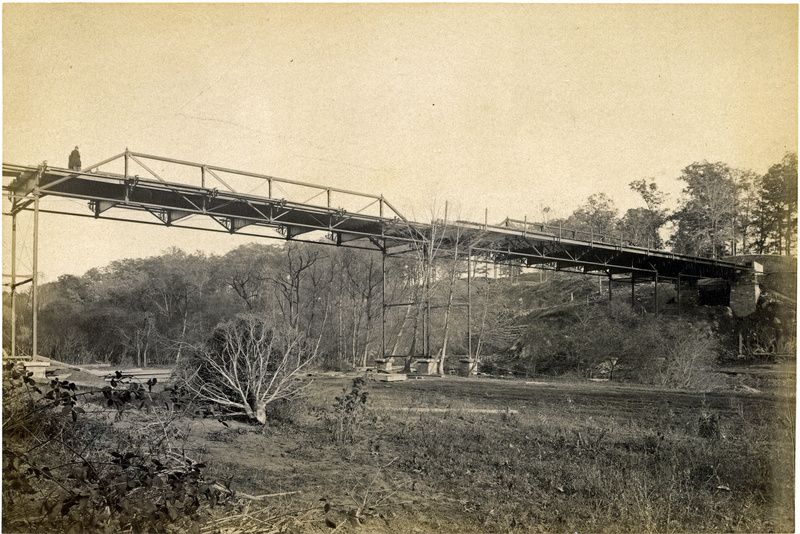 So many homes were planned and being built there that a real estate syndicate, tired of Congressional inaction, used private funds to build a public bridge over the ravine of Rock Creek in 1888. The supports of this bridge are still visible; a later bridge was constructed just south of the older one in 1901 (replaced in 1939), a long-planned and delayed main thoroughfare of Massachusetts Avenue, as wide as the dominant Pennsylvania Avenue, from the congested old city. 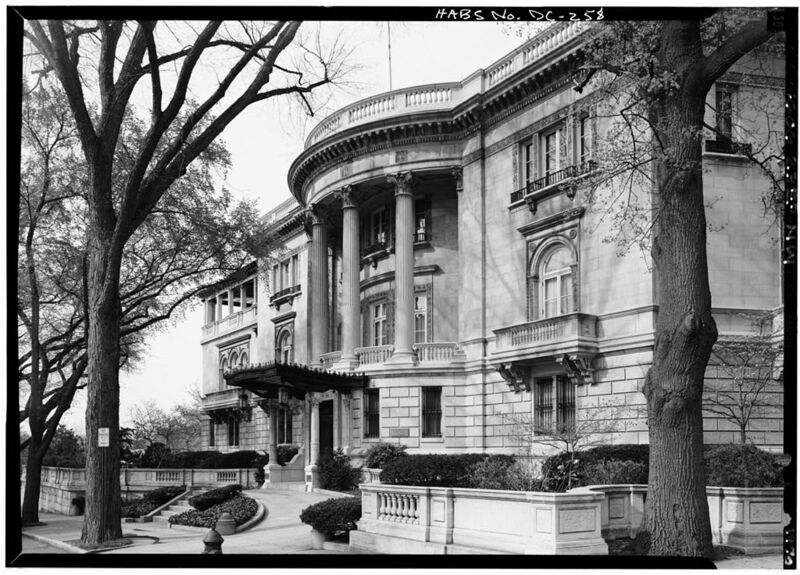 There had been a stately progression on the grand boulevard of mansions from around Dupont Circle (near the old Embassy) to Sheridan Circle, with its “Millionaires Row,” and beyond. 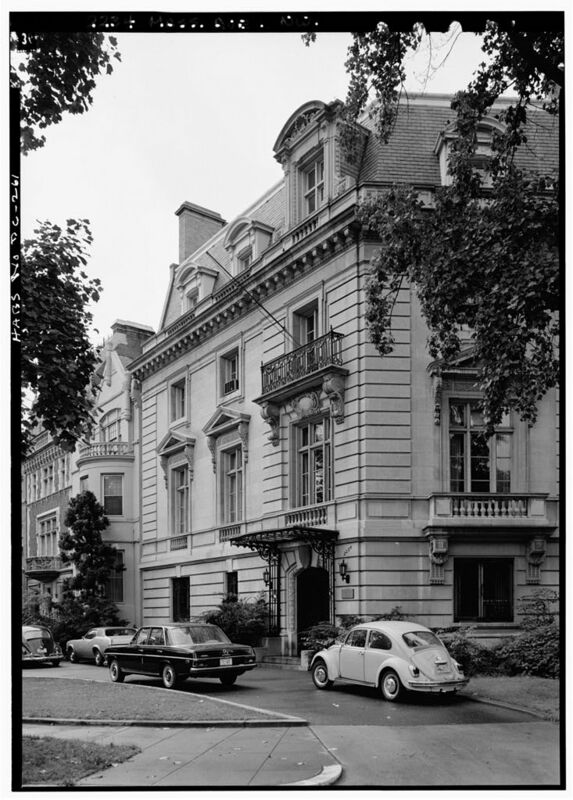 Later, following the Depression, this came to be known as “Embassy Row,” the diplomatic missions preserving the architecture from new apartment buildings. 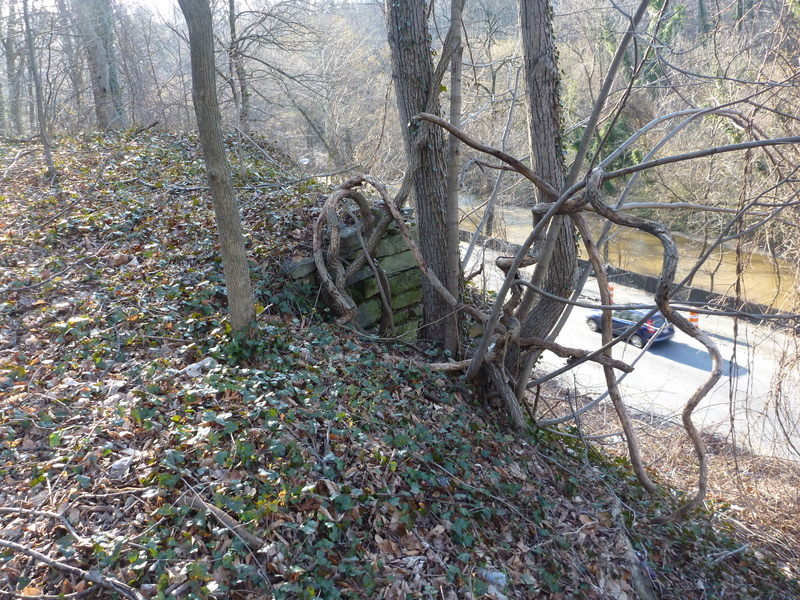 The British were not even the first diplomatic mission on the far side of Rock Creek Park. This post details some of the many significant buildings in this part of northwest Washington that predate the British Embassy, the “civilization” that was nearby. 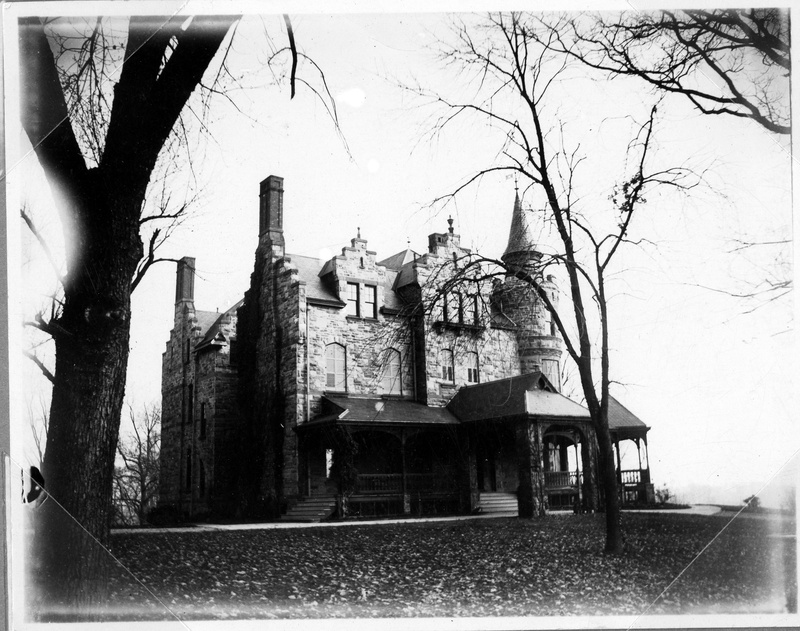 Of the 19th-century estates, ‘Normanstone’ has been examined in this website. There was the great Victorian pile of ‘Clifton’ (of 1884, replacing an earlier structure of 1857), presiding on a hill between the eventual site of the British Embassy and the estate that later became Dumbarton Oaks. ‘Clifton’s’ commanding spot was almost taken for the Naval Observatory but survived until 1949 when it burned down. 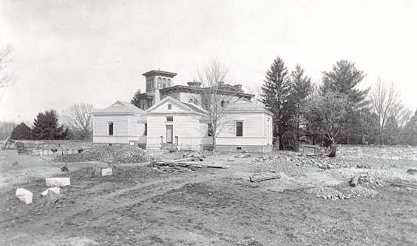 ‘Northview’ (about 1851), an Italianate villa and its outbuildings and grounds, was designed (in all likelihood) by Calvert Vaux and Andrew Jackson Downing, about the time the latter was working on plans for landscaping the National Mall. Vaux, with Frederick Law Olmsted, later carried out his late partner Downing’s ideas in the creation of New York’s Central Park. 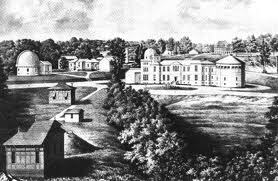 In 1881 the United States Government purchased ‘Northview’ as the new site for the Naval Observatory. 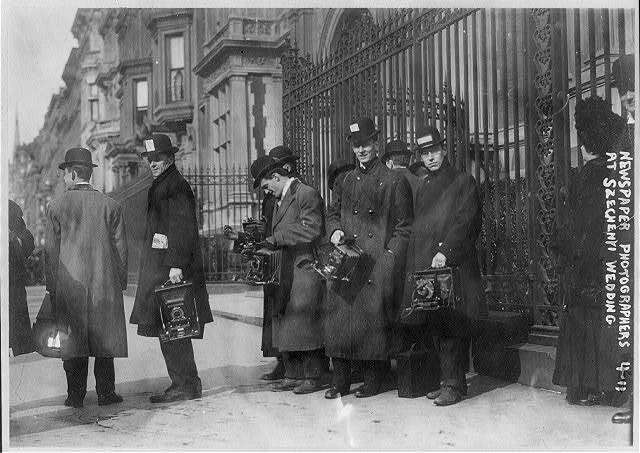 The main building was by Richard Morris Hunt, an architect famous for his opulent Newport, Rhode Island Gilded Age “cottages” and Fifth Avenue mansions but who worked here with uncharacteristic restraint. 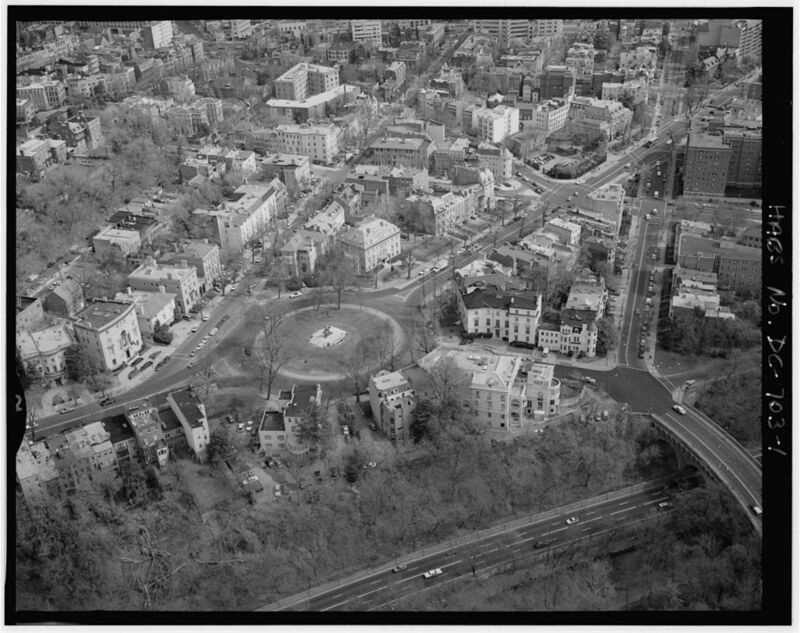 The Observatory scientists, whose duties included the calibration of ship chronometers, became so concerned about the increased traffic that the extension of Massachusetts Avenue was laid-out with a curve (the “circle” of Observatory Circle) to keep vibrations from traffic away from their delicate instruments, including the Master Clock of the United States. 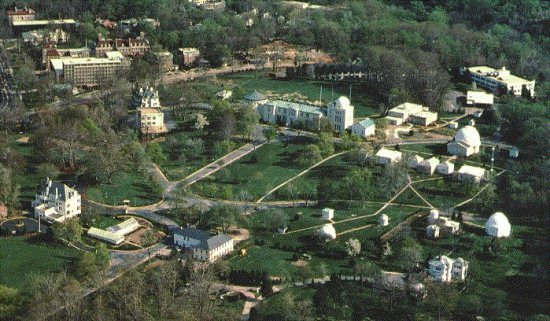 United States Naval Observatory aerial view, with the British Embassy in the upper left corner. What could have been: the manuscript Wall Report of 2147, Office of the Surveyor, District Government, before the United Kingdom Government’s purchase. It is said that the new embassy will be constructed upon less spacious lines. Cramped quarters will never convey the suggestion of power and of far-flung empire that one feels in the old embassy house. It would seem that the world is losing somewhat of the grandeur of the old, romantic days. The British Embassy cannot be understood in isolation from its environment. In the event, this misconception of the setting provides a good opportunity to look again at the Gilded Age landscape and Beaux Arts mansions that were transforming Massachusetts Avenue Heights—with decidedly diplomatic leanings—well before Lutyens drew up his inventive plan. The growing capital of the United States, with rapidly changing political, economic and social forces (including the “City Beautiful” movement), was assuming its mantel of a world power. At the turn of the 20th century, this transformation is best seen around Sheridan Circle, about a mile south of the British Embassy, the section once known as “Millionaires Row.” There were clusters of mansions of captains of industry, including those of unimaginable wealth from gold, copper and silver strikes far, far away from Washington, as well as displaced members of European aristocracy. The nation’s capital had become one stop in the revolving seasonal residences of the nouveau riche. Close by but across Rock Creek to the north, the later architecture tended to be more discreet, for the more quietly powerful. The designers and their clients seemed to understand that the forested terrain would provide scale with trees and shrubs, while the architecture needed to relate to the urban environment. The more generous lot sites and setbacks also afforded room for significant gardens. These neo-classical residences had a public face in their pastoral setting, meeting the demands of their upper class owners. 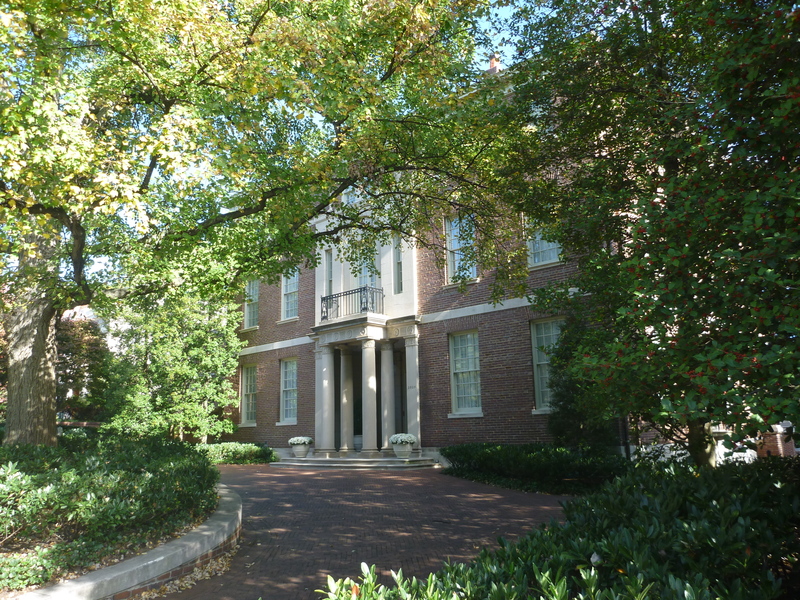 At the British Embassy, the Chancery acted as the forecourt to the more private Ambassador’s Residence. Baist’s Real estate atlas of surveys of Washington, District of Columbia. Philadelphia: G.W. Baist (1913, Map Division, Library of Congress). The McCormick House is shown at the intersection of W Street and Massachusetts Avenue. 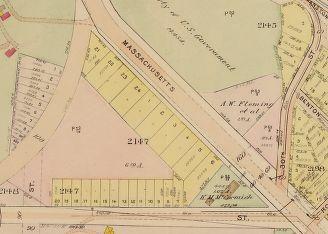 At the tip of Square 2147, 3000 Massachusetts Avenue is a triangular lot fronting the bridge and the Avenue at the intersection of W (now Whitehaven) Street. 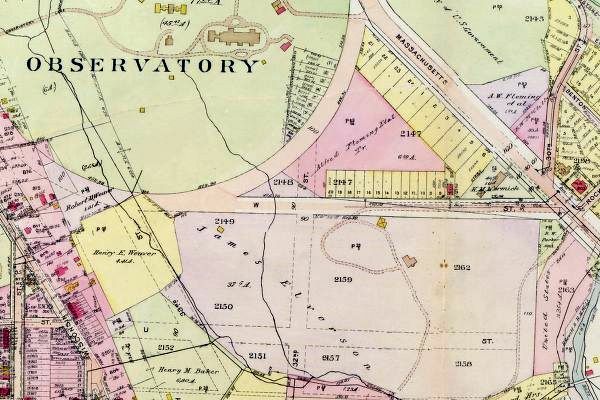 Originally part of the “Pretty Prospect” land grant (that included Oak Hill Cemetery and Dumbarton Oaks), this portion was already being divided into lots, squares and streets when a trust owned by Alfred Fleming, Isaac Jackson and William Edmonston sold this particular plot to Katharine and Robert Sanderson McCormick in 1907. He was the recently retired former Ambassador to Russia and to France as well as the first American ambassador to Austria-Hungary and of the prominent Chicago family (reaper fortune); she was the daughter of the owner of the Chicago Tribune. 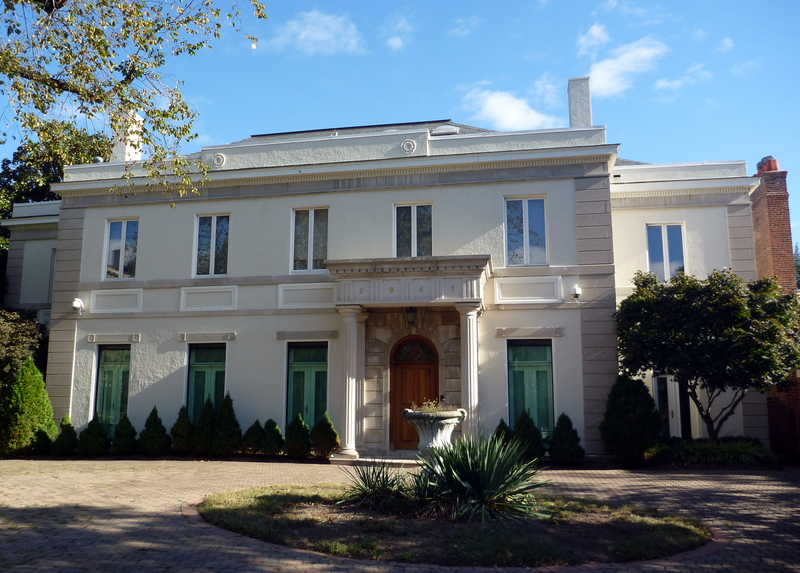 They had John Russell Pope design the austere but handsome Italian palazzo as their Washington home about 1908. Pope later served on the Commission of Fine Arts (1917-1922), before the quasi-government organization gave its “approval” to Lutyens’s design, and became famous as the architect of public buildings: the National Archives, National Gallery of Art, and the Jefferson Memorial. Thanks to Lord Duveen, Pope also designed additions to not only the Tate Gallery but also the British Museum. 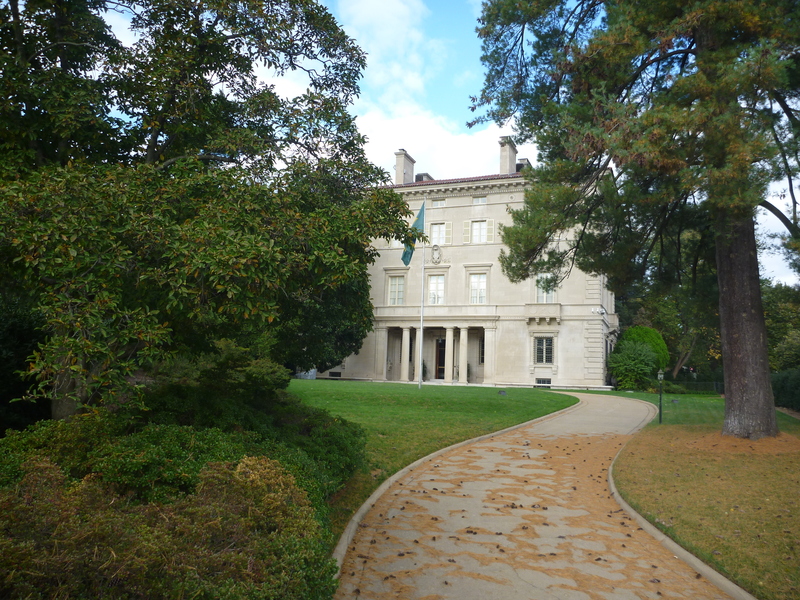 The McCormick House is now the Ambassador’s Residence of Brazil; its serpentine driveway remains, softening the transition from the apex of the lot, but not much of its landscaping survives. Its east-south façade takes advantage of the view, the same alignment as the future British Ambassador’s Residence. 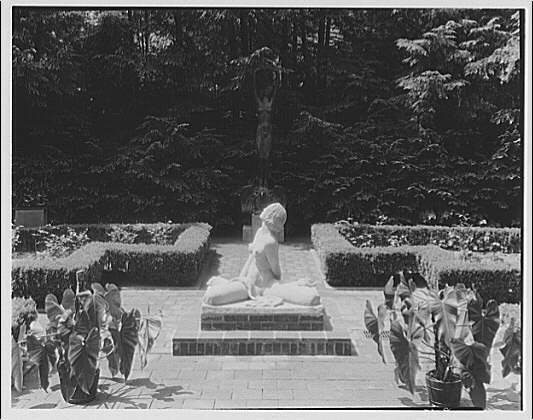 In 1917, directly across the McCormick House at 2929 Massachusetts Avenue, at the intersection of Rock Creek Drive, Maie Hewitt Williams commissioned architect Clarke Waggaman, known for his quiet Beaux-Art style, for a Georgian home. She sold the property in 1922 to Count László Széchenyi, the inventor of the submarine wireless telegraph, when he became Hungary’s first Minister to the United States. His American-born wife was Gladys Vanderbilt. Their wedding was at the Vanderbilt Mansion on Fifth Avenue in New York; so famous they were pursued by the press on their honeymoon. Countess Széchenyi was to inherit the grandest of all the Newport cottages,‘The Breakers,’ designed by Richard Morris Hunt in quite a different style than the contemporary Naval Observatory buildings. 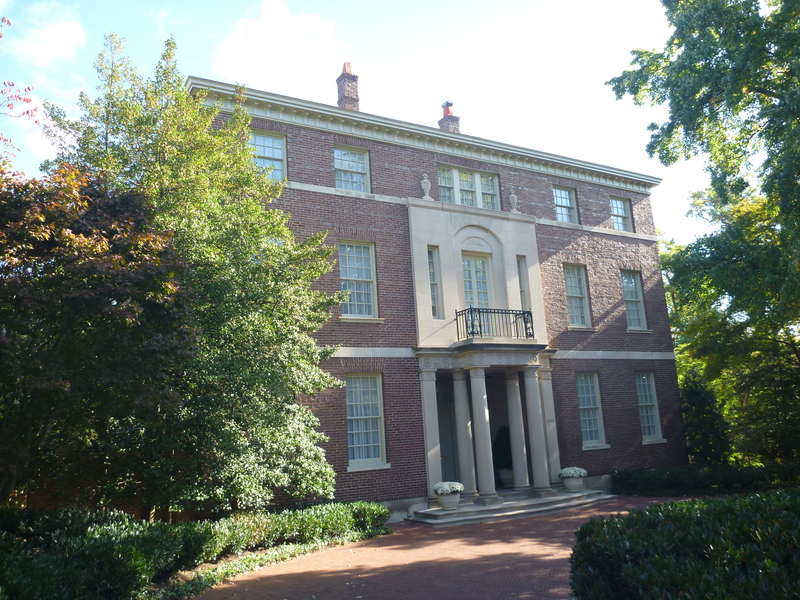 At their Washington home the couple expanded the garden, with surrounding terraces and walls, a facing portico (perhaps) in 1923 and did further renovations in 1927 with George N. Ray as architect, for the house on Massachusetts Avenue also served as the Hungarian Legation. Although not a full-fledged embassy, this would make their home the first diplomatic presence in this section of Washington. Another member of the elite, Elizabeth Lindsay, the wife of the first ambassador to occupy the Lutyens Embassy as well as its gardener, on one of her visits to Washington, stayed a stroll away, just off of the Avenue, with the Bayard Cuttings. They were prominent Old Guard friends of Long Island and New York City who considered her, the former Elizabeth Sherman Hoyt, part of the family. 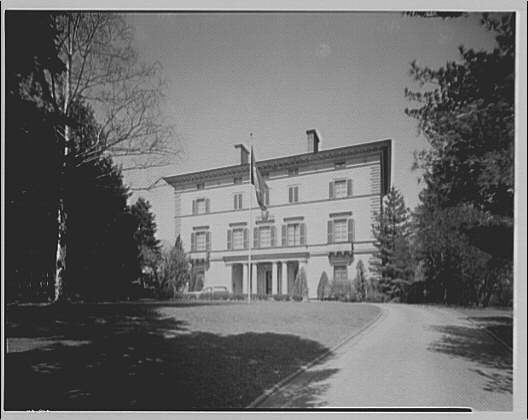 It is no coincidence that when the son, Bronson Bayard Cutting, when elected to the Senate in 1927, that he, along with his mother (Olivia Peyton Murray), decided to use as their capital base a home quite close by to the under-construction British Ambassador’s Residence: first in the rented Ansberry House (2839 Woodland Drive), built in 1920; and then in 1929 purchasing 2500 30th Street (built in 1927), a stone’s throw from the Embassy. 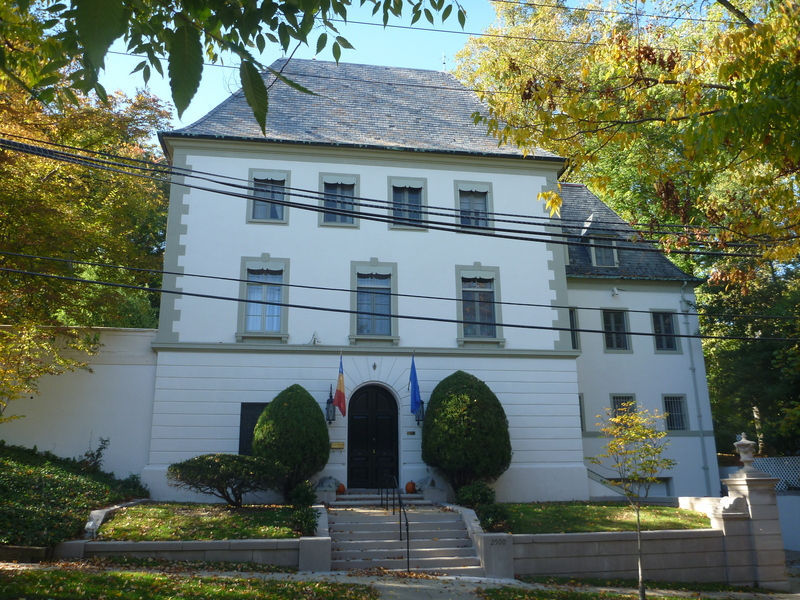 The former Bayard Cutting home is now the Ambassador of Romania’s Residence. 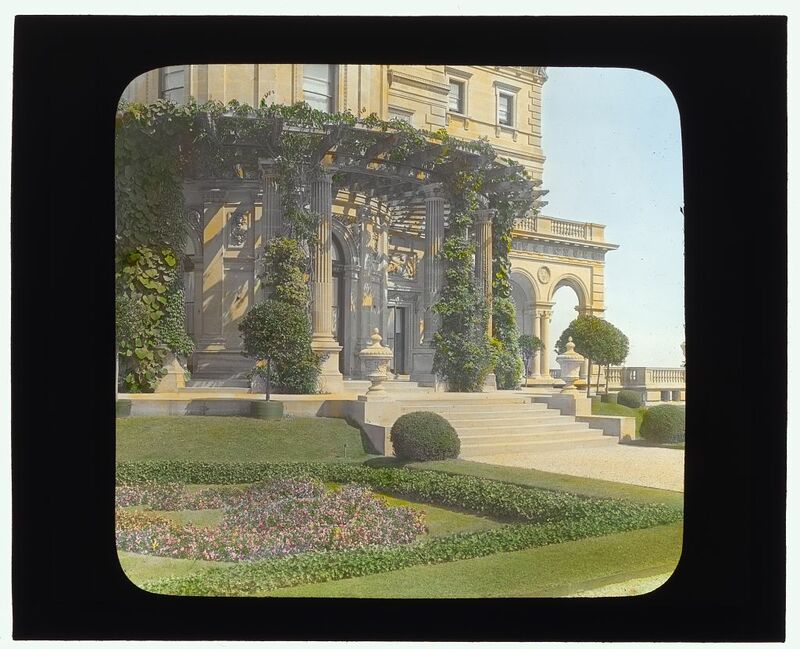 “The Breakers,” Cornelius Vanderbilt II house, Newport, 1914 photograph by Frances Benjamin Johnston (Prints & Photographs Division, Library of Congress). 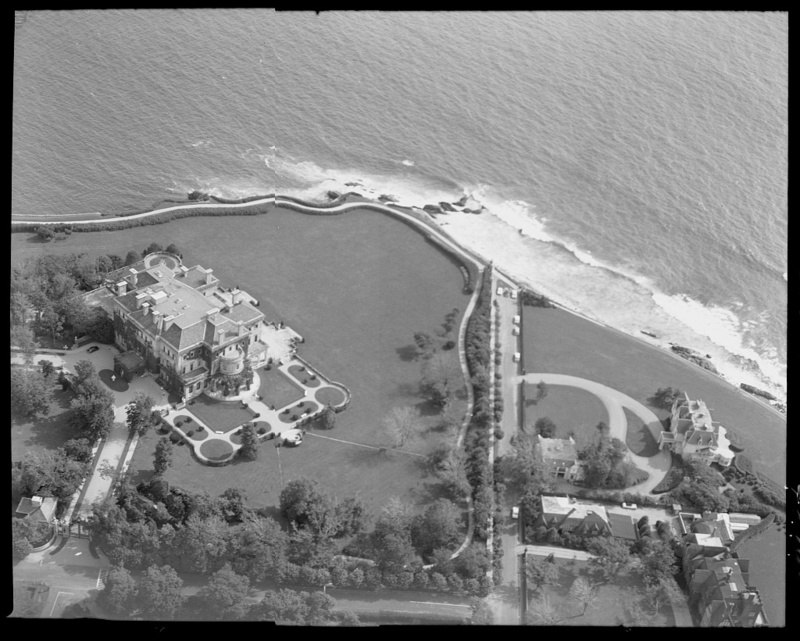 The Lindsays stayed here before moving on to the Bayard Cutting’s home, “Westbrook” on Long Island in the summer-early fall of 1930. As noted earlier on in this site, Harry Wardman and Frederick Brooke, while deeply involved in the planning and construction of Lutyens’s embassy, were busy putting up homes all around it—on Observatory Circle, Whitehaven (then W) Street and Massachusetts Avenue. But even farther north on Massachusetts Avenue, there were many homes pre-dating the announcement of the British Embassy’s location. 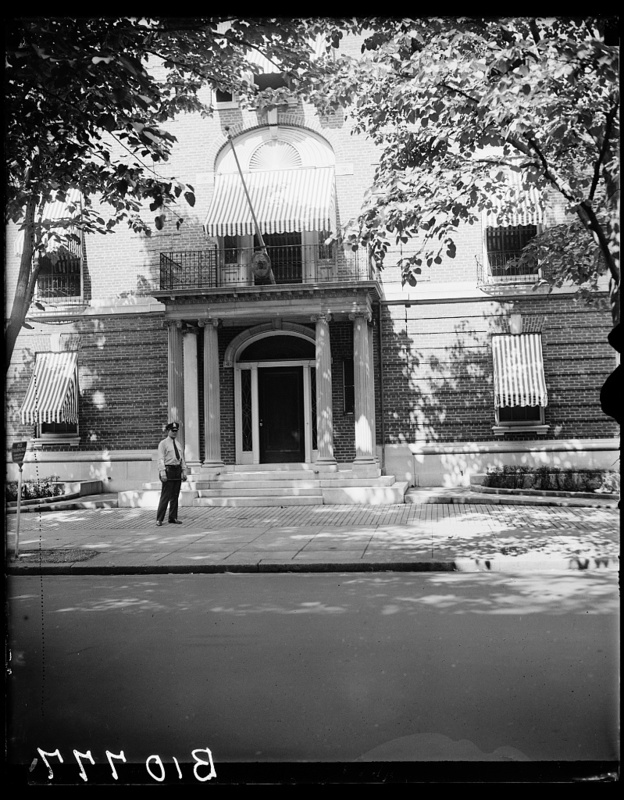 The Babcock-Macomb House, now the Embassy of Cape Verde, across from the Naval Observatory, was constructed in 1912, with Arthur B. Heaton as architect. Built for the widow of Joseph Weeks Babcock, a powerful former congressman, it was probably inspired by the nearby McCormick House. This northwest stretch of Massachusetts Avenue was never the Champs-Élysées, as it was not intended to be (no theatres and luxury shops). Outside of the city’s original 1791 plan, this section had become the grand boulevard of L’Enfant’s original vision of the newly created capital, with grand mansions and parks with statuary. 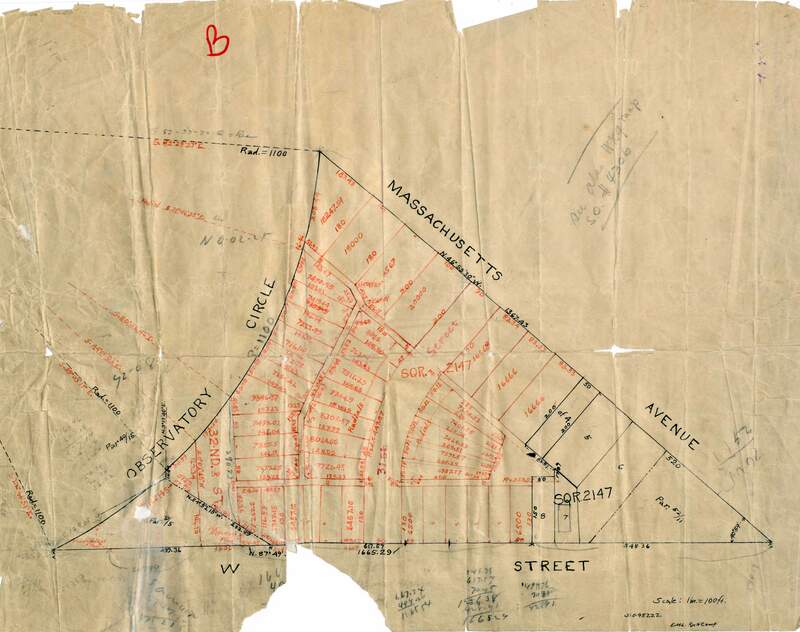 Already by the early 1920s, Massachusetts Avenue and the surrounding area, was not a remote and certainly not wild site at all. That was in the quickly receding past. With embassies more campus-like and suburban with private homes, this was a landscape of civilization, and a highly sophisticated and elite one at that. From the nomination form for the Massachusetts Avenue Heights area to the National Park Service for the National Register of Historic Places, 1974 (p. 9): On April 20, 1886, Senator Mahone of Virginia introduced a bill which provided for the orderly expansion of the City of Washington beyond its original boundaries in a continuation of the design principles of the L’Enfant plan. 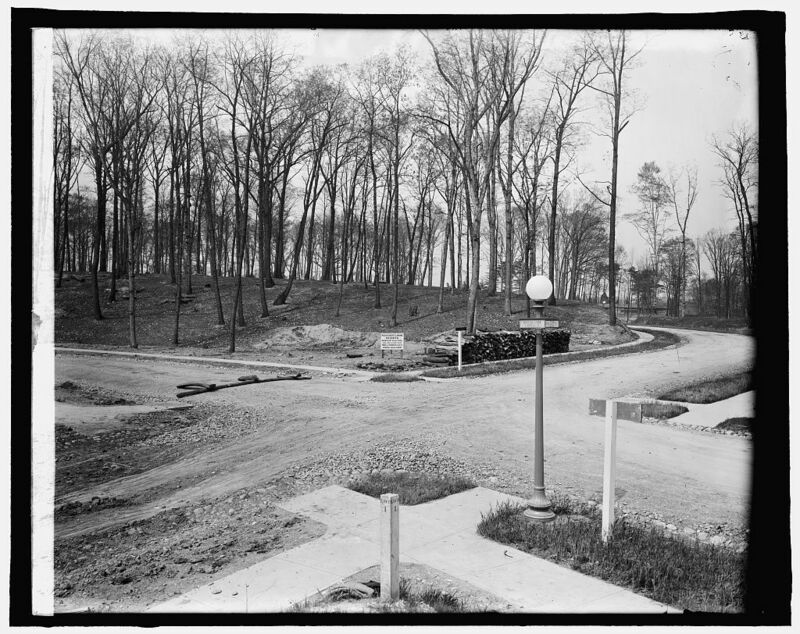 Under the Mahone Bill, Massachusetts Avenue—which at this time ended abruptly at a stone fence at Boundary Street—would be extended across Rock Creek Park and into the countryside as far as the Tennallytown Road [present day Wisconsin Avenue]. Senator Bayard Cutting of New Mexico, brother of Lindsay biography Olivia James, was killed in a plane crash in 1935. Appropriately enough but much later (2000), the Embassy of Italy built its own inspired Modernist palazzo, across on Whitehaven Street. Maie Hewitt Williams, mother-in-law of Joseph Leiter (who hosted Prince of Wales on Washington, DC visit in 1919). Count Széchenyi served as Hungarian minister until 1933 when he was appointed Minister to the Court of St. James. Barnes, Irston R. “Bryce’s lesson comes a little too late,” The Washington Post, 14 November 1965, p. G10. “Bridal pair vanished: Szechenyis are not at Westbury nor at Newport,” The Washington Post, 29 January 1908, p. 9. “British Embassy give way to march of trade,” The New York Times, 28 June 1925, p. SM23. “British envoy a visitor on Long Island,” The Washington Post, 21 September 1930, p. S4. “Capital their Mecca: many former diplomats come here to reside,” The Washington Post, 11 January 1914, p. 10. Gordon, Evelyn Peyton, “Brazil Envoy receives in celebrated mansion,” The Washington Post, 13 December 1935, p. 18. “Mrs. Bayard Cutting purchases home here,” The Washington Post, 6 August 1929, p. 7. Ray, George N. Architectural drawings for alterations to an embassy building for the Hungarian Legation, 2929 Massachusetts Avenue, N.W., Washington, D.C., 1927. Scott, Pamela and Antoinette J. Lee. Buildings of the District of Columbia. New York: Oxford University Press, 1993. An excellent, scholarly source on architecture, covering some of the homes in Massachusetts Avenue Heights. “Site for M’Cormick home: former Ambassador to France buys one Massachusetts Avenue extended,” The Washington Post, 16 October 1907, p. 12.